Objective. Silica particles are potent inducers of cell proliferation, cell injury, and inflammation, and oxidant release from alveolar macrophages, thus providing a mechanistic framework for their increased fibrogenicity. The Alveolar macrophages are viewed as a pivotal cell type in fibrogenesis in both lung defense and elaboration of growth factors and oxidants. In this study, we aimed to investigate serum TAS (Total Antioxidant Status), TOS (Total Oxidant Status) and OSI (Oxidative Stress Index) parameters in the individuals working in ceramic factory and diagnosed as silicosis and discuss the possible effects of these parameters on the etiopathogenesis of the disease. Methods. This study was performed on 33 male patients with silicosis (23-73 years) and 30 male healthy control (18-69 years) who were admitted to Ankara Occupational Diseases Hospital. Silicosis patients were diagnosed depending on their chest radiograms in accordance with the ILO 2000 guidelines. TAS, TOS levels were measured in blood samples and OSI was calculated according to formula (TOS/TAS). Results. Serum TOS levels of the silicosis subjects were higher than those of the controls whereas serum TAS levels of silicosis subjects was lower than those of the controls. But the differences between the parameters were not statistically significant. The serum OSI levels were significantly higher (p<0.05) in the silicosis subjects compared with the control group. Conclusion. Our study showed elevated OSI in patients with silicosis. Increased oxidative stress is thougth to be related with the oxidative burst caused by alveolar macrophage activation. 1. American Thoracic Society. 1997. Adverse effects of cyrstalline silica exposure (ATS statement). Am. J. Respir. Crit. Care Med. 155:761– 765. 2. Calhoun, W. J., et al. "Elevated immunoglobulins in the lavage fluid of healthy granite workers." Thorax 41 (1986): 766-773. 3. Green GM, Jakab GJ, Low RB, Davis GS (1977) State of the art: defense mechanisms of the respiratory membrane. Am Rev Respir Dis 115:479-514. 4. Veblen, D. R., and A. G. Wylie. 1993. Mineralogy of amphiboles and 1:1 layer silicates. In G. D. Guthrie, Jr. and B. T. Mossman, editors. Health Effects of Mineral Dusts. Reviews in Mineralogy, Vol. 28. Mineralogical Society of America, Washington, DC. 61–138. 5. Hochella, M. D., Jr. 1993. Surface chemistry, structure, and reactivity of hazardous mineral dust. In G. D. Guthrie, Jr. and B. T. Mossman, editors. Health Effects of Mineral Dusts. Reviews in Mineralogy, Vol. 28. Mineralogical Society of America, Washington, DC. 275– 308. 6. Vallyathan, V., X. Shi, N. S. Dalal, W. Irr, and V. Castranova. 1988. Generation of free radicals from freshly fractured silica dust: potential role in acute silica-induced injury. Am. Rev. Respir. Dis. 138:1213– 1219. 7. Schuyler M, Zisking M, deSalvaggio J (1977) Cell-mediated immunity silicosis. Am Rev Respir Dis 116:147-151. 8. Gibbs, A. R., and J. C. Wagner. 1988. Diseases due to silica. In A. Churg and F. H. Y. Green, editors. Pathology of Occupational Lung Diseases. Igaku-Shoin Medical Publishers, New York. 155–176. ISNAD Ünal, Kübranur , Çakır, Bağdagül , Demir Bal, Ceylan , Hınç Yılmaz, Ömer , Tutkun, Engin , Meriç Yılmaz, Fatma . "EVALUATION OF THE OXIDATIVE STRESS IN SILICOSIS PATIENTS". 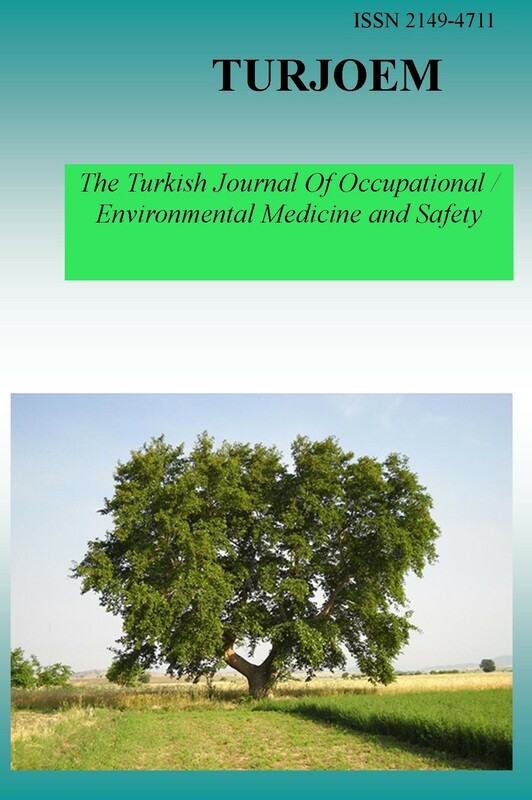 The Turkish Journal Of Occupational / Environmental Medicine and Safety 3 / 1 (February 2018): 5-5.